One of my New Year's Resolutions was (and is) to unclutter my life. I honestly think clutter (in any form) is disruptive on multiple levels. So I continue to try to find ways to streamline my world and diminish the burden on my poor tattered braincells. This week, I tackled something completely new. I uncluttered my keychain. I think I have accumulated almost 20 years worth of cruft and carried it around in my pocket without ever giving it any thought. But yesterday I looked at the jumbled hunk of jingling iron and said: "Wait a second, I don't need that any more!" And a few minutes later, I had a much more organized and much lighter keychain. Line up the links: I never realized it, but I had about 11 rings and they were strung off each other with no rhyme or reason at all. It was a sprawling explosion of loops that had clearly grown out of control. So I unhooked EVERYTHING, eliminated un-needed rings, and lined them up neatly next to each other, in a continuous chain. Reduce, reduce, reduce: I had items on my keychain that I would never (under any circumstances) use again. Never. No way. Those had to go. And I also had too many rings with just one item on them. Those had to go, too. Create functional groups: Previously I had everything spread everywhere. Pure, unadulterated chaos lurking in my pocket. I switched to three functional groups: car keys, work keys, and home keys. That's it. My entire life summed up in three simple groups. I removed an entire ring's worth of items: At one o'clock is an ancient RFID fob that used to get me into the front door at a dotBomb. 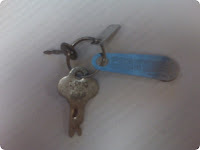 At three o'clock in my first Corby Key that opened the door to the MindSpring NOC. At six o'clock is an old tarnished key that opens a steamer trunk I've had for 20 years. And at nine o'clock is a small key for a luggage lock I haven't used since I married Cindy. Unseen but also removed were five unused rings, two plastic fobs for gyms (one in Atlanta!) that I don't have memberships to, and a beer bottle opener from my days of slinging drinks in college. One small facet of my life gets uncluttered. A couple million left to go.